The unemployment rate may be as high as "42 percent." 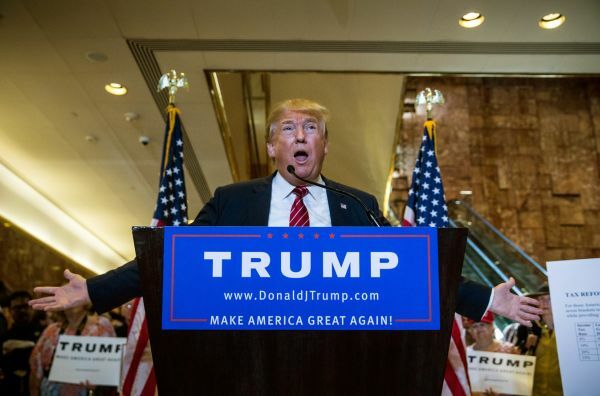 By Louis Jacobson on Wednesday, September 30th, 2015 at 10:00 a.m.
During the televised press conference in which he announced his tax plan, Republican presidential frontrunner Donald Trump returned to a claim he has made before -- that the official unemployment rate -- currently 5.1 percent -- woefully undercounts the percentage of people who are unemployed. During the Sept. 28, 2015, media event, Trump described an unemployment rate in the range of 5 percent as "such a phony number." "The number isn't reflective," he said. "I've seen numbers of 24 percent -- I actually saw a number of 42 percent unemployment. Forty-two percent." He continued, "5.3 percent unemployment -- that is the biggest joke there is in this country. … The unemployment rate is probably 20 percent, but I will tell you, you have some great economists that will tell you it's a 30, 32. And the highest I've heard so far is 42 percent." We previously rated False a claim by Trump that "our real unemployment is anywhere from 18 to 20 percent." So if 18 to 20 percent is false, how does 42 percent rate? We took a closer look. We’ll start by offering a refresher about how the official unemployment rate is calculated. The Bureau of Labor Statistics, a federal agency, uses surveys and statistical sampling to calculate how many Americans do or don’t work. To calculate the unemployment rate, the agency divides the number of people who are out of work (counting only those who have recently looked for work) by the sum of the job-seeking and job-holding population. Not factored into this calculation are people who are not currently looking for work. This is the portion of the population that alternative measures -- such as those cited by Trump -- attempt to factor in. Broadly speaking, supporters of these alternative measures say that not working, regardless of the reason, is tantamount to being unemployed, and should be reflected that way in the official measurements. We asked the Trump campaign for a source of the 42 percent figure, but they didn’t respond. The Fact Checker, however, traced it back to a column by David Stockman, who served as President Ronald Reagan’s budget director. Stockman calculated that there are currently 210 million Americans between the ages of 16 and 68 -- what he calls a "plausible measure of the potential workforce." If you assume that each of those people is able to hold down a full-time job, he wrote, they would offer a total of 420 billion potential working hours. However, during 2014, Stockman noted, only 240 billion working hours were actually recorded by the Bureau of Labor Statistics. If you run the numbers, "the real unemployment rate was 42.9 percent," Stockman wrote. Economists say Stockman’s way of looking at the question -- using actual hours worked divided by a theoretical maximum that could have been worked, rather than determining whether individual people are employed or unemployed -- is provocative. But they say this raw measurement has serious flaws. In the column, Stockman himself acknowledges that this figure is imperfect, even though his tone is flip when he does so. "Yes, we have to allow for non-working wives, students, the disabled, early retirees and coupon clippers," he wrote. "We also have drifters, grifters, welfare cheats, bums and people between jobs, enrolled in training programs, on sabbaticals and much else." Snark aside, economists say this caveat is crucial. Stockman’s calculation "treats people voluntarily working part-time hours as partly unemployed, even if they have excellent reasons for wanting to hold only a part-time job, such as rearing children, attending school or college, being disabled, or transitioning into retirement," said Gary Burtless, an economist at the Brookings Institution. "A lot of the shortfall between full-time and part-time employment is perfectly reasonable, as is a potential worker’s decision not to work or look for paid work at all." In other words, Trump’s faith in the accuracy of the 42 percent figure is misplaced. All of this spotlights a long-running debate among economists about whether there is a better way to calculate the unemployment rate than the one traditionally used. It’s within the economic mainstream to believe that the traditional method that produces 5.1 percent is too limiting, even if the far more permissive calculation that produces 42 percent is vastly overstated. The Bureau of Labor Statistics itself offers a more expansive alternative measurement of labor "underutilization" called the U-6 rate. The U-6 rate includes both those who are officially "unemployed" and those who are working part time for economic reasons and those who are "marginally attached" to the work force, meaning they want to work but have not looked for work recently enough to count as being actively in the labor force. Currently the U-6 rate is 10.3 percent, about double the official unemployment rate. For the sake of argument, we decided to see if we could come up with a percentage that approaches Trump’s 42 percent. We started with the 94 million Americans age 16 and up who are not either (1) employed, (2) unemployed, (3) in the military or (4) institutionalized. We then subtracted the number of people who have good reasons not to be working or looking for work. Here’s a summary. In other words, there are perhaps 11.5 million Americans who do not have obvious reasons for not working (though they could be full-time students between 34 and 65, undergoing job training over age 29, or be affluent enough to be able to forgo work or retire early). If you turn this into a new type of "unemployment" rate, it comes out to 16.4 percent. That’s higher than the U-6 rate of 10.3 percent, but it’s only a small fraction of the 42 percent Trump claimed. As Burtless told us previously, most of those suffering from being "out of work" can actually be seen as benefiting from their membership in an affluent, technologically advanced society. "The fact that these adults are jobless is not a marker of economic failure -- it is an indicator of a very prosperous society that can afford to permit the old and disabled to retire, that can invest in young adults so they can improve their skills, and that can keep some adults in the home where they can care for children or attend to other non-paying pursuits," he said. This isn't the first time Trump has used the 42 percent number. In August, our friends at the Washington Post Fact Checker gave a similar statement from Trump Four Pinocchios, the column’s harshest rating for truthfulness. Trump then repeated it in his tax-plan press conference. Trump keeps repeating that the unemployment rate may be as high as 42 percent. But getting a percentage that high requires believing that being a high school, college or graduate student, a senior citizen, a stay-at-home parent, a job-training participant, or having a disability is no excuse for not holding down a job, or for working less than 40 hours in a week. The highest alternative unemployment-rate measure we could come up with that had any credibility was 16.4 percent, and even that exaggerated figure is only about one-third of the way to Trump’s 42 percent. We rate his claim Pants on Fire. CORRECTION, Feb. 11, 2016: We've updated this story to reflect some changes to the statistics for students listed in the table. Our new calculation puts the highest "unemployment" rate we could produce at 16.4 percent. The rating remains Pants on Fire. Published: Wednesday, September 30th, 2015 at 10:00 a.m.